I finally mailed my August kits for my quilting bee. I am requesting string blocks for a Fall quilt, using these fabrics and a mixture of different solid strips for the centers. I included directions, and links to a couple good tutorials for reference. I was excited to carry my packages to the post office in style, thanks to this fabulous market bag my friend Amy made for me as part of a swap we did with each other last fall. I am looking forward to snuggling under this new quilt-in-the-works on those crisp Fall days. I’m picturing a cozy campfire with a knitting project in hand. Can you tell I’m getting a little tired of the hot, humid summer days? You are so good at putting fabrics together . Wished I was that good. I might have been quilting and sewing for many years but still not good at putting fabric together. That quilt will be so cute. Love that first block. I’m doing the same thing for September in one of the VQB’s I’m in! I may have to check out the tutorials you note for future reference. 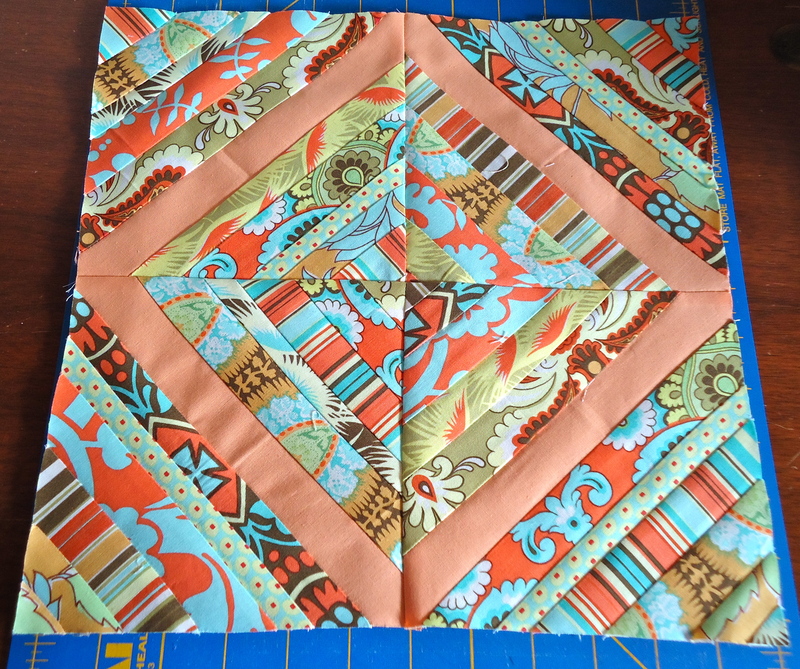 Great color and fabric choices, your block is so pretty and what a great fall quilt you’ll have. Can’t wait to see the blocks you get back. Love the bag, lucky you. 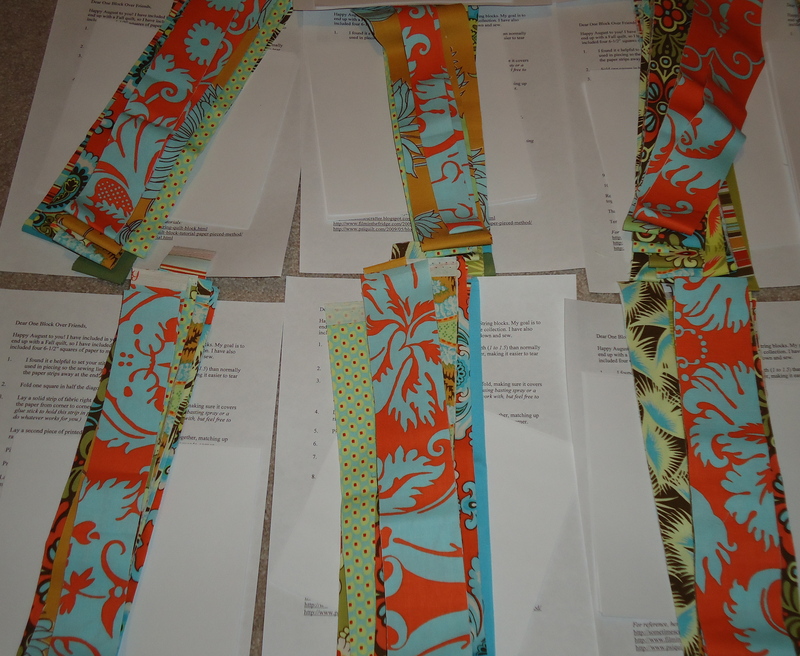 Your partners will have a lot of fun making these and the fabrics you chose are delicious! I hope you get them all back! 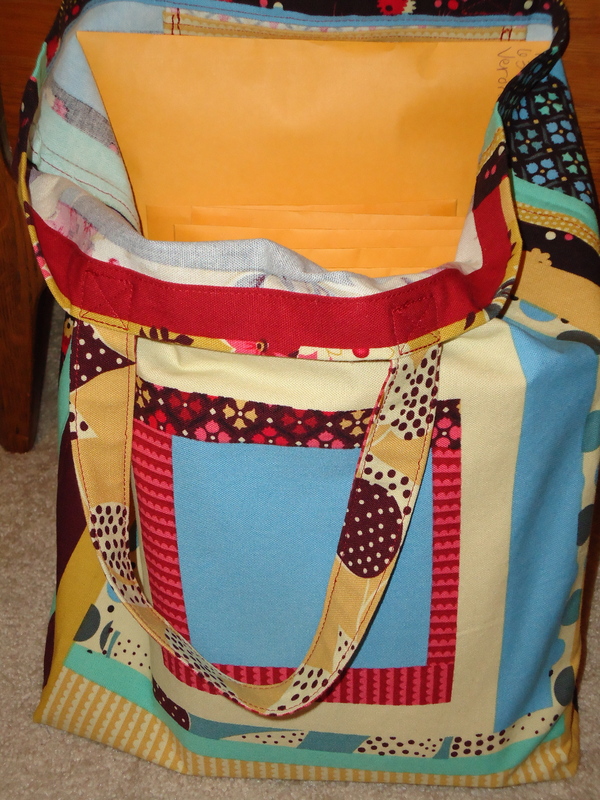 Fabulous bee blocks and market bag! I guess she was the last to use this computer before me. Funny — that happened to someone leaving a comment on my blog earlier this week. Dearest terri, such gorgeous colors!! You are really good at putting fabrics together!! Your kit looks wonderful and i am so in love with your gorgeous block! Oh my i LOVE your bag too!! It’s beautiful! Have a lovely merry happy day and love to you! I SERIOUSLY LOVE string quilts. They make me smile and I snuggle under mine almost every single day! GORGEOUS colors-I can’t wait to see the finished product! Thanks for your recent post to my blog about the rooster paper cutting. I like your new tote bag. I bet you’ll receive many compliments on it! Your quilt is going to be wonderful! String quilts are one of my favorites! I love the bag that Amy made for you, lucky girl!